Dealing with Debt: Which Solution is Best for You? Home/Debt/Dealing with Debt: Which Solution is Best for You? If you are one of the many people who are currently struggling with debt, you are probably on the lookout for some sound advice. The fact is, there exists four main options for dealing with debt. These are debt consolidation, a debt management plan, individual voluntary arrangement and bankruptcy. Here we take a look at the pros and cons of each. This option involves taking out a single large loan that can be used to settle the balance of other loans. The advantage of this is that the single loan can be obtained at a lower interest rate, preferably at a fixed interest rate, which will make repayments more manageable. It also has the advantage of reducing the complexities of having several loans at the same time. The disadvantage here is that in order to gain a lower interest rate the loan will have to be ‘secured’. In other words, the loan will be secured against an asset, which is known as ‘collateral’. In most cases, this collateral will be property (either a house or apartment). On the downside, whilst the monthly repayments may be lower, the total amount owed is generally much higher because of the longer period of the loan. 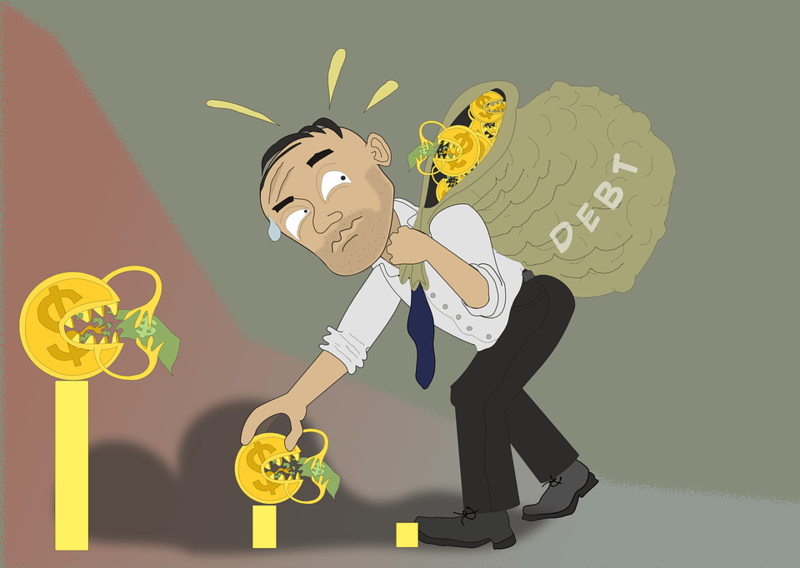 A debt management plan operates by consolidating all debts and reducing the higher interest rates of existing debts. Whilst it may appear similar in essence to receiving a debt consolidation loan, in reality this option doesn’t involve any further loan at all. Rather it is simply a plan whereby all monthly repayments will be lumped together into one single, affordable payment plan ranging between 24 and 48 months. The disadvantages here include the fact that creditors are within their rights to change their mind at any time. In addition, it may still have a negative effect on your credit rating and, as with debt consolidation, whilst the monthly payments may be reduced the total amount repaid will be significantly higher. The good thing about this option is that the situation will be swung in favour of the debtor as opposed to the creditor. Whilst previously it would be the creditor who ‘calls the shots’, so to speak, piling more and more pressure on the debtor, with an individual voluntary arrangement or IVA in place, the creditor will no longer have the right to take out legal action against the debtor or to add extra financial penalties. Drawbacks include the fact that the IVA is a formal agreement, meaning the debtor will find themselves bound to its terms, which includes having to submit financial statements each year and also that the payment terms remain very rigid. In addition, the debtor will be unable to receive any other credit agreements whilst the arrangement is in place. The main advantage to filing for bankruptcy is that the slate will be wiped clean, as all debts will be discharged. Therefore, the debtor will then be free to an extent to start over again. In addition, bankruptcy can ensure that all of the debtor’s vital property, whether it is a house or car, will be protected. Creditors will not be within their rights to repossess. On the downside, the bankruptcy will remain on the individual’s credit report for a maximum of ten years, making the possibility of receiving further credit within this period unlikely. In addition, whilst the ‘Bankruptcy Code’ is there to ensure no discrimination on the part of creditors or banks is permissible, such discrimination does, in reality, tend to exist. This guest post was written on behalf of IVA Expert. My only option is to pay mine off – something of which I am completely capable – but I understand that all of these are options for those who can’t. I am with you Daisy…that being said other’s sometimes need to get a grip and I think these solutions are a start for some people. I think debt consolidation would have helped me but I was so scared by the apparent scumminess of these folks. There are SO many shady shady people in the business. So thankful I don’t have enough debt to credit any of these options. I look at debt reduction like a diet. If you want to lose weight, you have to cut back on calories and exercise! unless the amount of debt is too crushing, i would suggest to pay it off. you can usually negotiate the debt yourself. say something like, i can borrow money from a relative. doesnt make sense to settle debt with someone who has money in the bank. this is how stupid the cc companies are. they usually wont settle with you unless you are late ona few payments.